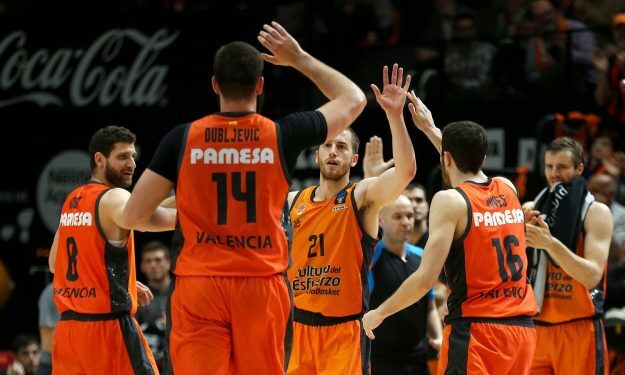 Valencia moves to the EuroCup quarterfinals with a spotless Top 16 record. Valencia had already secured top spot in Group G but wanted to finish the Top 16 stage with the best possible record. Not only for the prestige but because it will play a role in homecourt advantage in the next phases of the competition. Already eliminated Limoges fought well but ultimately was no match for Valencia that won 91 – 84 to conclude the Top 16 as the only team with a perfect 6-0 track. Matt Thomas scored a game-high 17 points without missing a shot from the field (2/2 2-pointers, 4/4 3-pointers) for Valencia. Fernando San Emeterio added 14 points and Sam Van Rossom 12 points and five assists. On Limoges’ side, Axel Bouteille had 16 points and six rebounds and Dwight Hardy 16 points as well. In Tuesday’s Group G games, Crvena Zvezda defeated Unicaja Malaga to finish the season on a high note.